Turn sequence - [R]efill hand to 7, [I]mplement: Play cards, [C]ombat, [E]nd turn. (R.I.C.E or ABCD phases - i.e. if anything refers to A phase, its Refill step). Deck construction - 35 cards EXACTLY, cards can be ordered. Deck is intentionally stacked, not shuffled - no need to worry about marking cards / Cards with different backs. This is unique to Megacorp. 7 duplicates allowed except founders and businesses (1 each). Each point of Damage to players causes players to mill one card (Discard one card from top of their deck). Players who cant draw or can't mill any more lose. Resource system - INVESTING. Return cards in hand to top of deck, each card INVESTED from hand generates one trait of its colour. INVESTING controlled cards already bought/in-play generates trait equal to full cost of card invested*. Combat - Only characters can attack. All cards can block. Each character attacks once per turn, can only block once per turn. Each character attacking is resolved one by one (E.g. : different targets) Cards are turned 90 degree sideways when attacking (Engaged). Players can be targeted for attacks, as can individual cards. Cards be declared as blockers (which then retaliate with the same coloured trait). The player himself can be declared as a blocker for a card in his network (i.e. : take the damage on behalf of a card. Players cannot retaliate.). A player can block any number of times this way. Idle rule: (tournaments only) - players that do not invest or attack in entire turn, discard a card at end step. Cashflow = ability that passively gives free colourless Trait at the start of each turn. Cards with the cashflow ability don't generate trait if they begin the turn engaged. Defender = the target of an attack in combat. Search = Several cards allow searching of the deck. All references to resource deck or main deck, refer to the single deck (The business plan). The deck does not need to be shuffled afterwords, but the card searched for has to be revealed to all players. Each player should have their own deck comprising EXACTLY 35 cards. This deck is referred to as the 'Business plan'. Cards referring to 'resource deck' or 'main deck' are referring to this single deck of cards. Besides founders and business (Red card backs - only allowed one business and one founder per deck) Players can have up to seven copies of any other card in a deck. Yes you did not read that incorrectly. Seven. Players DO NOT need to shuffle their decks - in other words, players can determine the order of their decks in line with their personal strategy. Note: Cards in Megacorp have different backs, this essentially means that a player can use different kinds of cards as built in 'markers' if they left the different coloured backs visible. Each player then draws SEVEN cards which are not shown to the other player(s). This is the hand. The maximum number of cards in a hand is SEVEN. WHO STARTS FIRST - both players choose and reveal a card from their hand. The player with the higher costed card begins first and discards that card. The other player does not need to discard the card revealed. If this is a tie. both players discard the cards revealed and then reveal another, repeating this process. Note: When the game starts, the player that started first will go through all 4 phases of a turn, and will refill their hand up to 7 straight away. The act of bringing an inactive card into play is called 'buying'. To INVEST a card means to return a card to the top of the deck as part of a cost. INVEST and INVESTED mean the same thing, the different words are used for the sake of correct english grammar. 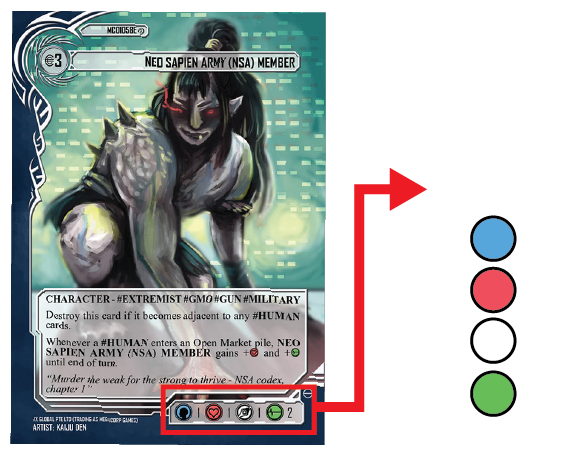 TO INVEST, cards are replaced from the player's hand (or from in play, see below) to the top of their deck. The order of these cards returning to the deck is determined by the player who is INVESTING. When players INVEST cards from their HAND, each card INVESTED generates ONE trait only E.g. : A blue card that is INVESTED generates ONE blue trait. (and only one no matter what the cost of the invested card was) usually the cost is composed of a plain number with the money symbol representing 'any' and/or a coloured TRAIT. Cards which have already been bought can ALSO be REINVESTED to pay for costs, this means that a card that is already in play is returned to the top of the controlling player's deck- this is slightly different from investing cards from the hand because INVESTING cards in play creates Trait equal to the valuation of that card, not just one point. Players can INVEST any/all disengaged cards that they control, already in play. When such cards are INVESTED, they give a number of trait equal to the ENTIRE VALUATION. That means a card that was played last turn for 3 ANY + 1 green (BQ) Trait will give the Investing player 3 colourless Trait and 1 Green trait. A character that is engaged cannot be invested. Reinvesting means to put a card from your network on top of your deck to gain trait equal to its Valuation You can only reinvest during your turn and only while paying the cost of a card youre buying from hand. Cards are primarily played from a player's hand onto a zone called a 'Network' (or battlefield) where the card becomes active and can be interacted with. Each player has their own network. To buy cards, a player must spend a cost. This cost is called a "Valuation" which is indicated by numbers and symbols in the top left hand corner of each card. The costs are paid with a resource called "TRAIT". There are four TRAITS - BLUE, RED, WHITE and GREEN. A card with a cost of 1 ANY + 1 BLUE means that a player has to Invest one card which is blue and Invest one card of ANY colour. The colour of each card is simply the colours it has in its cost. As mentioned in investing: To generate trait, players return cards from their hand to the top of their deck (A process we call 'INVESTING' hence why this ruleset is called the 'INVEST RULESET'), returning each card generates Trait which is used to pay for the costs. The players must pay TRAIT to pay these costs. TRAIT is generated from INVESTING cards. If a card has more than one colour in its valuation when it is consumed during investing, the player has to choose which of its colours the trait generated is. As players have no 'life value', each players health is determined by the number of cards left in their DECK. Players lose cards from their deck when they are dealt damage. Players who have no more cards in their deck and are required to discard one or more cards from it loses the game. Players who are required to draw a card from their deck and are unable to do so, lose the game. Essentially, players can lose because they have been dealt damage, or can lose as a result of running out of cards to play. Players who aggressively invest will find themselves running out of cards faster. Optional: In a tournament setting, players are advised to lay out their deck in stacks of 7 cards. This is to make it easier for judges and the opponents to see how many cards are left. Non-characters, such as the business card, do not deal retaliation damage. If any character receives equal or more damage than its trait score, it is immediately destroyed and goes to the open market (Discard pile). Cards which have been dealt an equal or higher amount to any of their non null traits values are destroyed and placed in the discard pile. ENGAGED creatures may not attack or block. Creatures which attack a player and are not blocked deal damage to the player. For each point of damage dealt to a player, the player who was attacked has to discard a card from the top of their deck. E.g. : 3 points of damage is dealt, means the top 3 cards of that players deck is placed into that player's discard pile. When a player is dealt damage and no longer has any cards in their deck, they lose. The cash flow ability provides colourless trait (can only be used to pay for "any" trait) and this generates at the start of the turn: The R (or A) phase, passively. The trait generated goes away harmlessly at the end of turn (E phase). Cash flow begins to work only the turn AFTER the card with cash flow is played. All money symbols refer to colourless trait. Meaning costs with the numbers next to money symbols can be paid with any trait. (Any colour). Cards that produce numbers with the money symbol are producing colourless traits. Cards which are invested to play other cards will produce a Trait dependent on its colour identity. The type of colour of Trait can be selected by the symbols in the Valuation (The cost at the top left hand side) of the card. NOT the trait scores of the card at the bottom. A card in hand with two different symbols e.g. : Red and Green in its valuation can be invested to produce a red OR a green, the playing investing simply decides which of the two colours it produces upon investing. However if a card which is already in play is reinvested, it gives trait equal to ALL the symbols and colourless trait value. Network and battlefield mean the same thing. When players buy cards, they place them in a battlefield /network. Each player has their own network. Players can only block attacks with cards you control in your network. Players can opt to play a character in an opponent's network. But a character in another players network can only block attacks made to THAT player. Adjacent means "within the same network". Melee is an ability that means a character can only attack a player or card in the same battlefield which it is in. This ability means the player controlling a card with melee has to move it into an opponent's battlefield to attack that player. Area attack ability. All area attack abilities now effect all cards in the same battlefield. E.g. weaponised ants (area attack 2x2) would basically attack any number of cards in one field up to its highest dimension (2). Meaning the ants can attack a player, OR attack up to 2 cards in the same battlefield using the full value of its chosen trait for each one. Cards that affect columns or rows: e.g. Cards that affect columns affect DISENGAGED (RIGHT SIDE UP) CARDS IN ONE BATTLEFIELD.